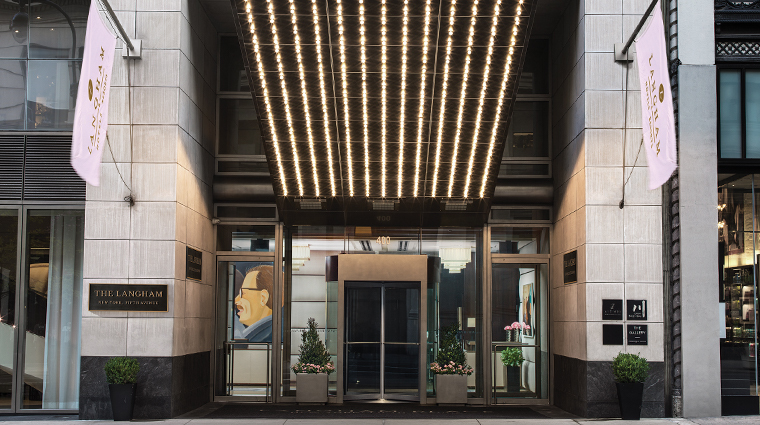 Upon entering The Langham, New York, Fifth Avenue you are greeted with the luxury hotel brand’s signature pink roses and elegant ginger flower aroma, a gentle reminder that details are not overlooked at this Midtown spot. 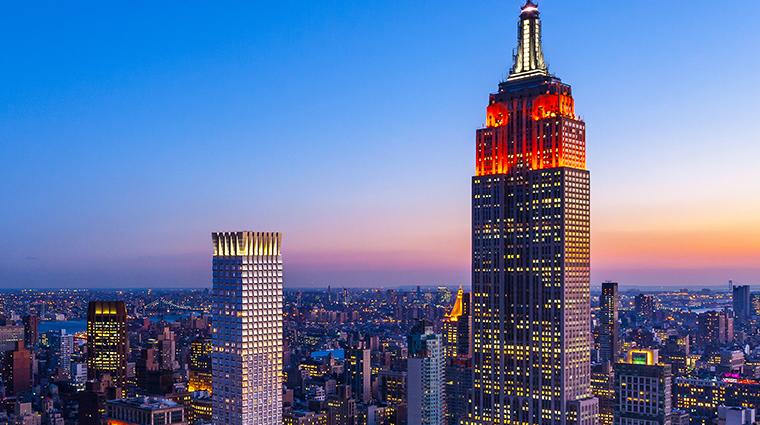 Its iconic Fifth Avenue address and central location (near the Empire State Building, Times Square and Rockefeller Center) make it popular with both leisure and business travelers. 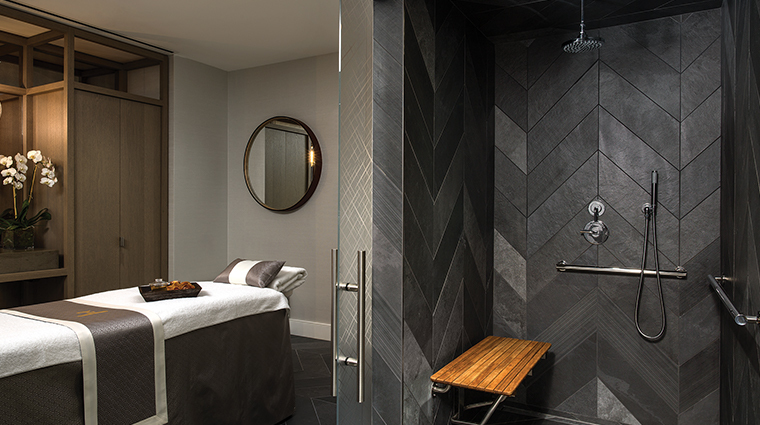 Thoughtful amenities and attentive service are a trademark of The Langham — here, you are attended to even before you arrive. “Service stylists,” who make it their duty to ensure New York City dreams become reality, gather your preferences pre-arrival. Whether it’s tickets to a show, reservations at a trendy restaurant or a flexible checkout time, they aim to make it happen. 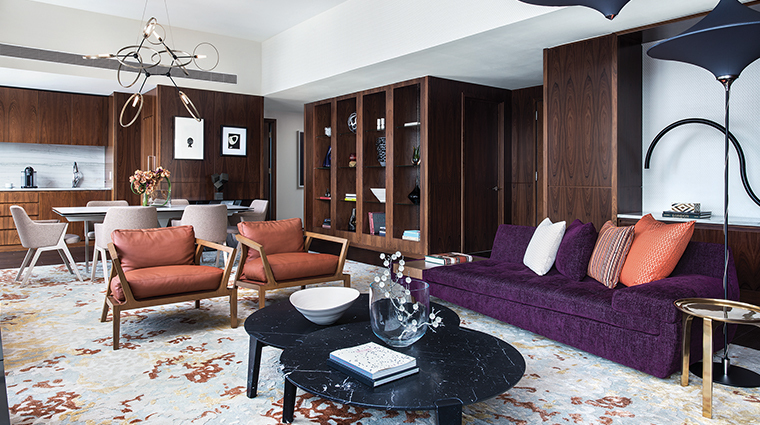 A recent overhaul of the lobby and lounge area has brought a new elegance and glamour to the neighborhood. 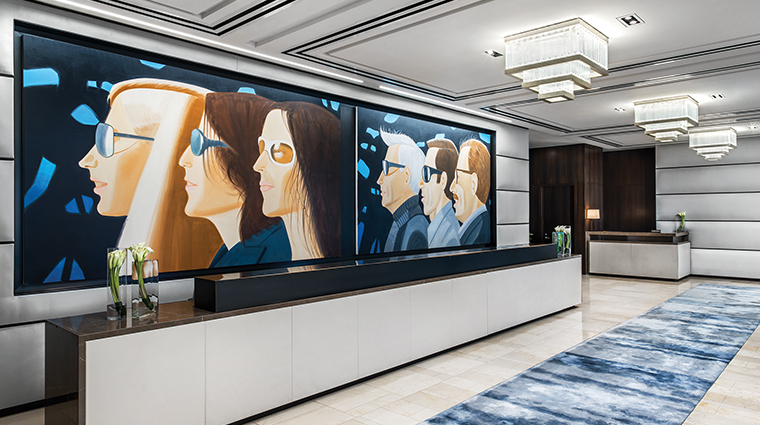 The centerpiece of the lobby — two oversized paintings by contemporary American artist Alex Katz — breathes life and color into the glossy space. 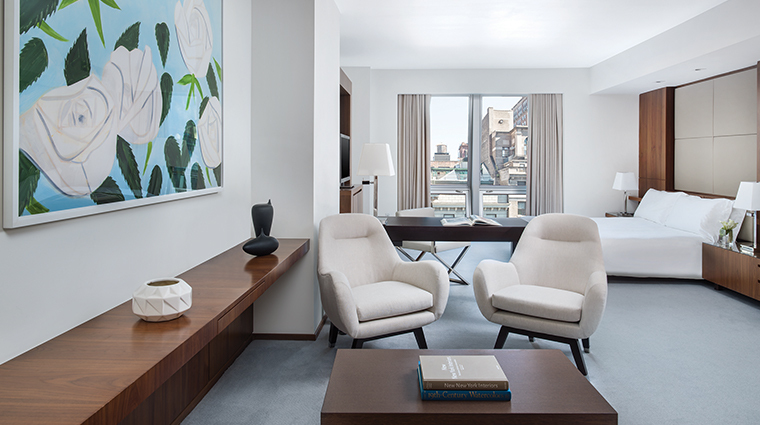 The artist’s work is prominently featured throughout the New York City hotel as well as in guest room corridors and even in some of the rooms and suites. The lobby’s dramatic winding staircase and avant-garde floral arrangements (by Ovando) complement the chic vibe. 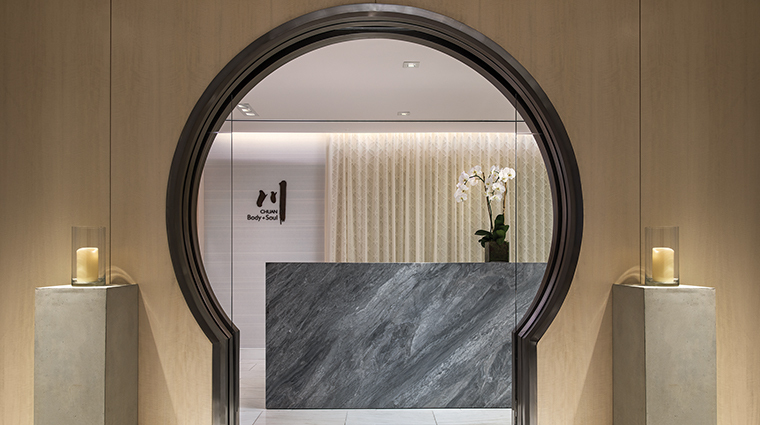 Look for the new Chuan Body and Soul Spa (which is undergoing renovations) to debut with an indulgent international-influenced spa menu with Chinese medicine tenets. Catering to how things are done in NYC, the fitness center is open 24 hours a day and you can book a trainer or yoga instructor to help you with your workout. And while New Yorkers espouse the efficiency of the subway system, nothing beats a ride in the Midtown Manhattan hotel’s house car — a chauffeured Jaguar XJL, available on a first-come first-served basis. 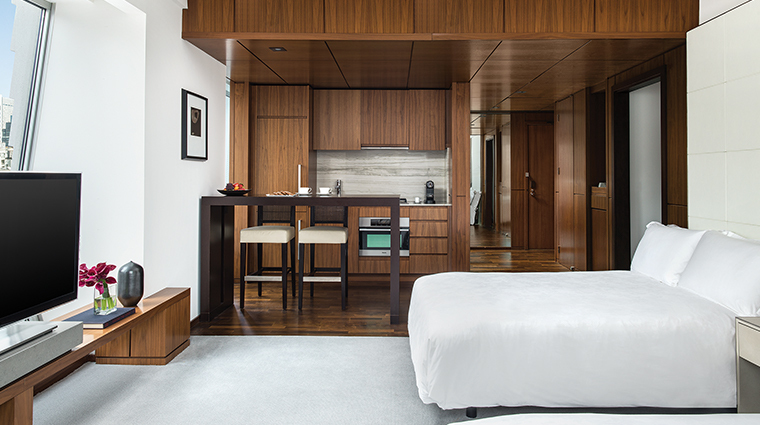 Guest rooms are well-appointed and quite spacious by Manhattan standards (they average of about 750 square feet). 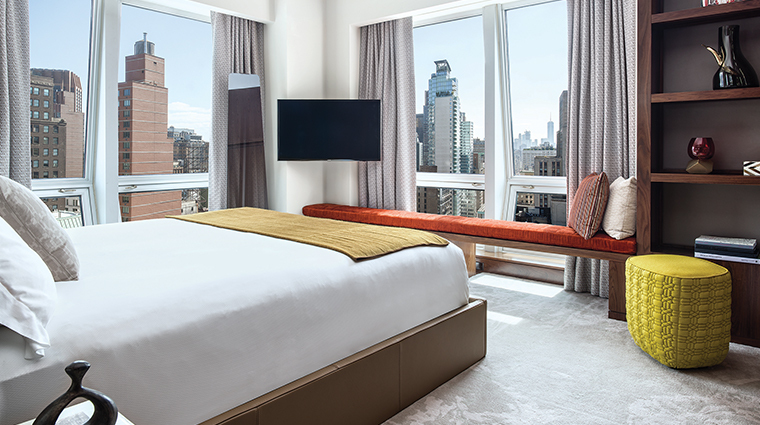 And with sweeping views of the city’s skyline through large windows (many are floor-to-ceiling), the hotel takes full advantage of its position. 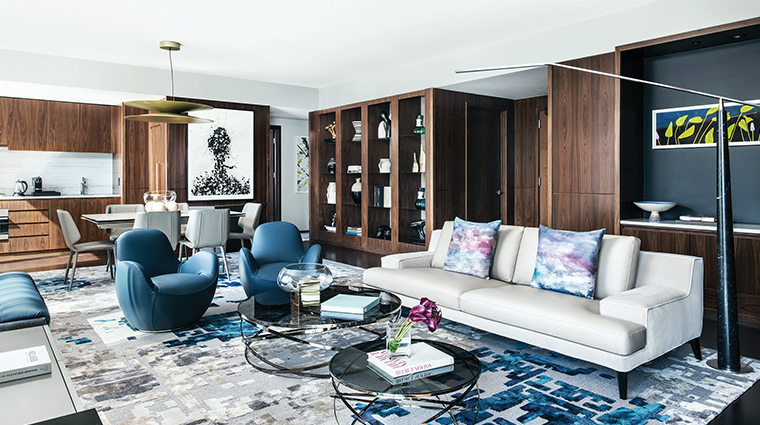 Room décor is simple and chic, with white linens, gray accents and Italian walnut furniture. 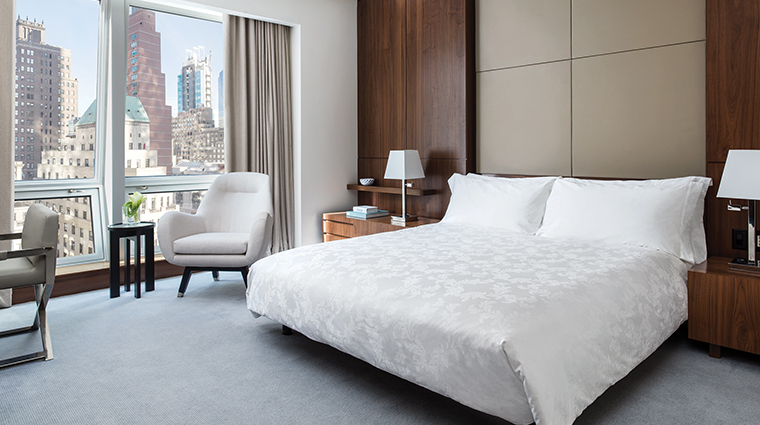 Luxury amenities like Swedish Duxiana beds, Italian linens, flat-screen TVs, Nespresso machines, robes and slippers are standard here. 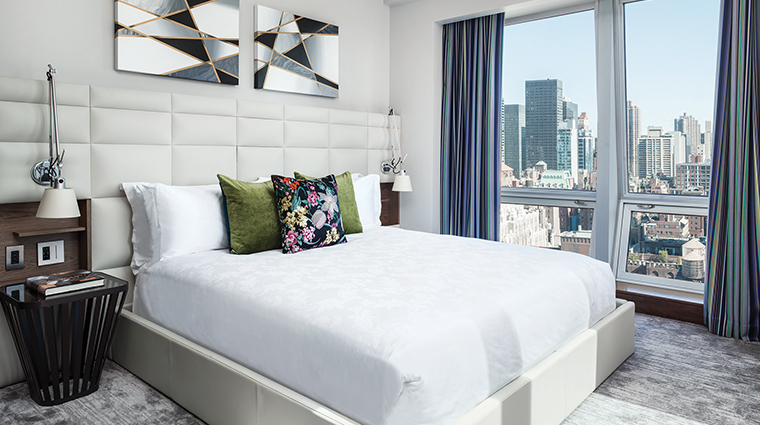 Suites have complimentary bottled water and sodas, full kitchenettes with Miele appliances, including washers and dryers (a New York novelty, indeed). 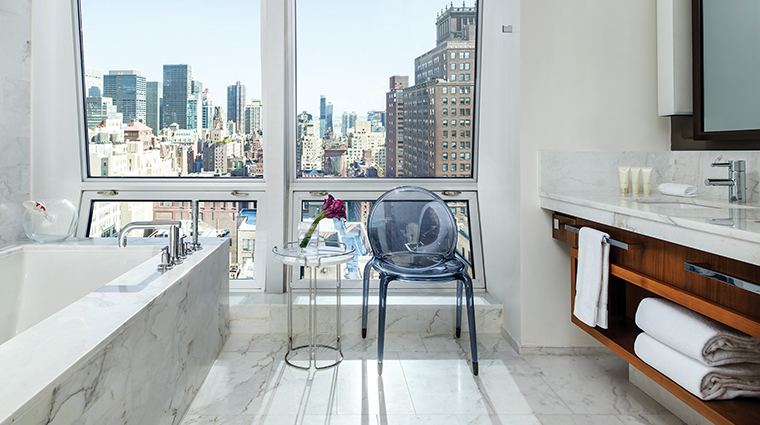 Marble bathrooms are bigger than many New York City apartments, with lavish accoutrements like in-mirror televisions, deep-soaking tubs and rain showers. 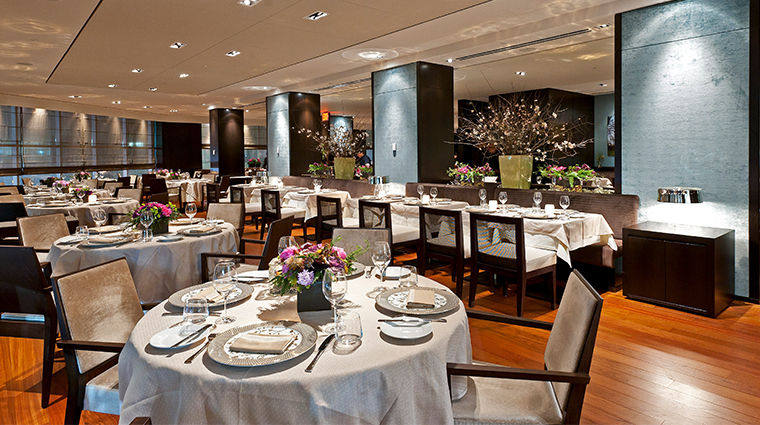 The Langham is home to acclaimed chef Michael White’s Ai Fiori. 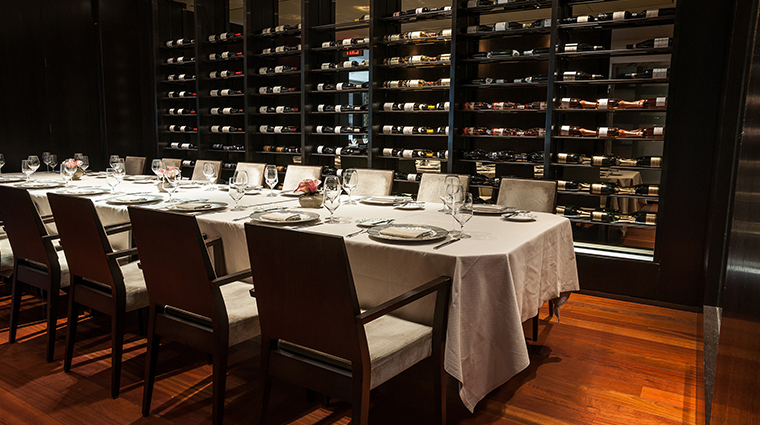 The restaurant features cutting-edge Mediterranean fare inspired by the French and Italian Riviera. 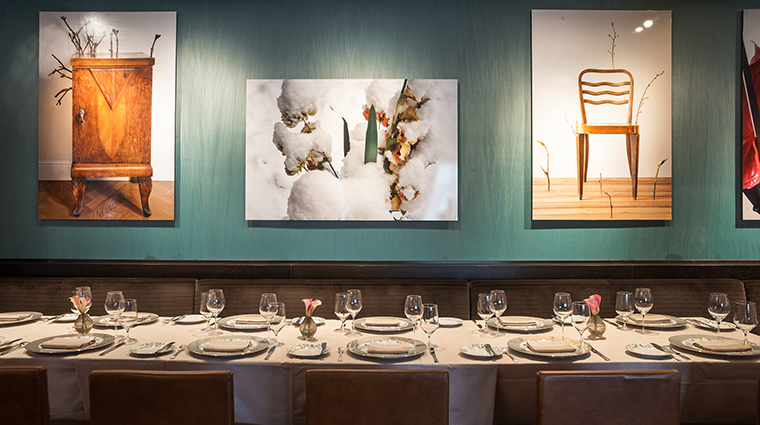 A sophisticated but not stuffy space is filled with pretty floral arrangements (fittingly, as ai fiori is Italian for “among flowers”). Enjoy dishes such as risotto with butternut squash and cranberry beans or pan-seared sea scallops, cauliflower purée with farro and walnuts.